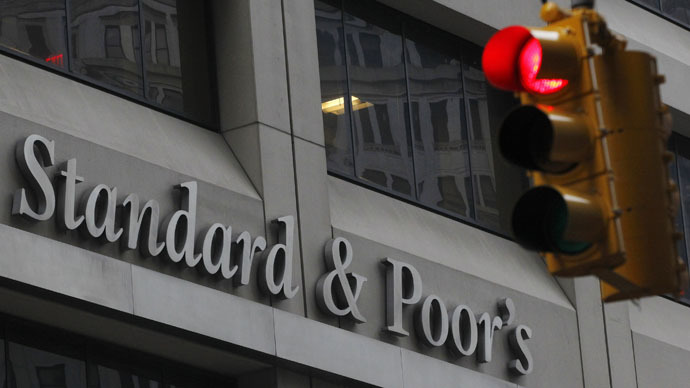 US-based credit rating agency Standard & Poor’s has cut Russia’s sovereign rating to BB+, leaving it below investment grade for the first time in a decade. Moscow termed the decision "overly pessimistic." “The downgrade reflects our view that Russia's monetary policy flexibility has become more limited and its economic growth prospects have weakened. We also see a heightened risk that external and fiscal buffers will deteriorate due to rising external pressures and increased government support to the economy,” said a statement from the agency. Russia's Finance minister Anton Siluanov said S & P's move was "overly pessimistic, and did not take into account the strengths of the Russian economy." Among its advantages he listed Russia's considerable foreign currency reserves, a positive balance of payments, and low levels of state debt. The official urged investors to "avoid dramatizing the situation." It blames both the "structural problems" of Russia’s economy, and the cycle of Western sanctions and counter-sanctions imposed since the succession of Crimea from Ukraine last March. It said that all credit ratings given to Russian companies and banks will now be at the discretion of the board of directors of the bank. The regulator will assess whether or not the ratings made after March are accurate. The decision came after Fitch and Moody’s had downgraded Russia's sovereign debt to just above junk status. Moscow and Beijing announced their intention to create a rival rating agency to S&P’s, Moody’s, and Fitch later this year. The two countries are already partnered through the Universal Credit Ratings Group (UCRG), which was set up in Hong Kong in 2013 and already encompasses the most respected agencies from both countries, as well as the US-founded Egan-Jones Ratings Company. The new agency may be an expanded version of UCRG, which is still predominantly used by internal Chinese investors. Russia’s foreign currency reserves stand at a respectable $380 billion – the sixth biggest in the world - and sufficient to finance any immediate obligations. But the Russian Central Bank has been forced to burn the money keeping the ruble afloat, and budget shortfalls due to oil prices may also have to be covered from the coffers.